The path to power is paved with long years of study and practice. The most ordered and disciplined of minds are needed to arrive at this place in full balance and with the Nirvana-like awareness that, all along, you never needed any of this power. It is at this state that you have become a master of yourself, one with the universe, and you can be secure in letting the power ebb away while you sit in silent contemplation of the long journey you have taken. A true Jedi Master. … Or you can actually use that power that you’ve worked so hard to gain! Sure, there is something to be said about sitting in weird chairs in near silence next to several other odd looking aliens… frog people, any number of folks with head tails, and that guy that you’re sure you’ve seen going on anger-ridden tirades using all sorts of expletives. How controlled and well-balanced do you think that guy’s mind really is, anyway? None of that sounds like the path that you’ve set in front of yourself. No. Let’s go with the power and use it to make sure that the people we care about will be safe forever! Well, as it turns out, that little green guy probably had a point as your body has become rather crippled and scary. But, your power is in tact! 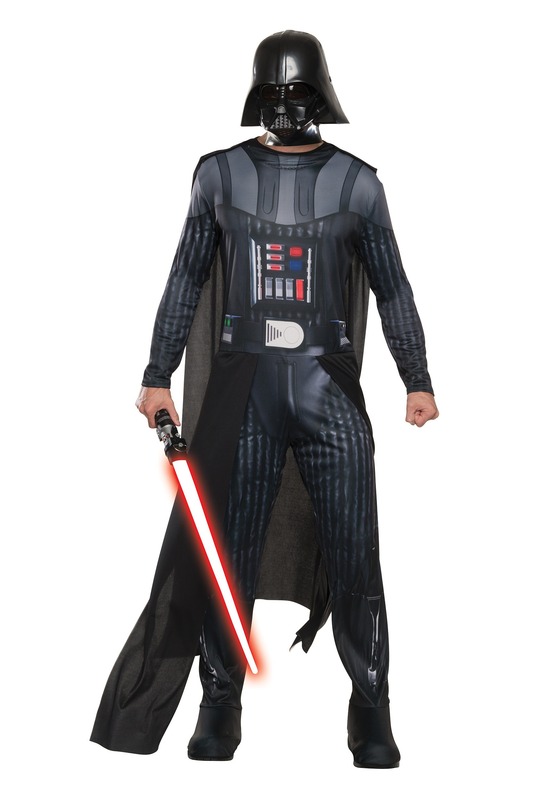 We’ve got you covered, literally, with this Darth Vader Adult costume. Your armored jumpsuit is made of comfortable polyester with robotic graphic print on the front and back. Your magnanimous cape will flow as easily as your power and stay connected through the mighty power of the Force… and Velcro. And, fear not, your lava-burned face and rebreathers will keep you strong (and concealed) in the face of friends and family, a mesh covering to keep them from seeing the pain in your eyes. You’ve worked for the power. It’s time to use it. But, just in case you haven’t worked out your telekinetic abilities, yet, you might want to pick up a nice red lightsaber, too.